To fix serious software issues, it may be necessary to perform a hard reset on your Samsung Galaxy Camera.™ A hard reset (also called a factory data reset) will remove all data from your camera and reset all settings back to their original values. There are two different ways to do a hard reset on your Samsung Galaxy Camera. We will cover both below. The preferred method is through the settings menu. Warning: ALL USER DATA WILL BE WIPED IF YOU PERFORM A FACTORY RESET. Performing a Factory data reset will erase all data from your device and internal SD card, including any photos or other media, your Google account login, system and application data and settings, and downloaded applications. It will not erase current system software, bundled applications, or files on your external SD card. It will not erase your Gmail or Google information from the server, so you can log in again afterwards with your Google username and password. Lost data cannot be retrieved after a hard reset, so please back up all information and pictures you wish to save before performing a hard reset on your camera. 1. From the home screen, tap 'Apps'. Note: If you are performing a hard reset because you suspect a 3rd party app is causing problems for your camera (for instance, your camera started experiencing problems shortly after downloading a new app due to a bug in the app), disable automatic restore on this screen by unchecking the box. This will prevent the app from downloading again automatically until you choose. 4. Select 'Factory data reset'. 5. 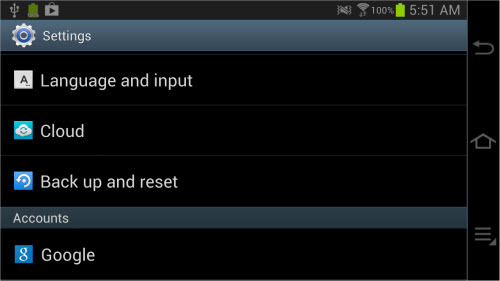 Tap 'Reset device', then follow the prompts to perform the reset. 6. Wait several minutes for the reset to complete. Once complete, the camera will reboot, and prompt you to start the initial setup. Even if your camera is frozen and you cannot access the settings, you can use an alternate method to hard reset it. To hard reset your camera when you cannot access the settings, follow the steps below. 1. Ensure the camera is powered off. If it will not power off, remove the battery for a moment and then reinsert the battery. 2. Slide the Zoom toward the left [+ sign]. While holding the Zoom to the left, press and hold the Power Button. Keep holding both buttons until the Samsung logo appears, and then release both. You will enter the Android system recovery screen. 3. Use the Zoom (move left or right) to highlight 'wipe data/factory reset', then press the Power button to select. 4. Use the Zoom to highlight 'Yes __ delete all user data', then press the Power button to select. The camera now takes a few seconds to reset. 5. Once camera has reset, use the Zoom to highlight 'reboot system' now, then press the Power button to select. The camera will reboot and prompt you to start the initial setup. If a hard reset does not fix an issue with your phone, it will probably need service. Please contact 1-800-SAMSUNG.